Did you read my post yesterday about the pink water bottle? 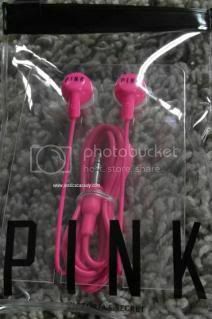 The reason I bought the water bottle is to get this pink ear phones for free. Yes! I got the ear phones for free from Victoria’s Secret with a certain coupon code in the check out. There are many colors but of course I pick the pink. The package came before my kids arrive from school that day. My little girl loves to open a package. She always ask permission from me if she could open it. She sees the water bottle. She taught that it is only in the package. I told her , check more maybe there is another item. She found a small box where the ear phone is. She taught that all the items are for her. 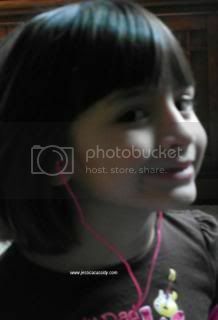 She put on the ear phone. You can see it in the picture how happy she is. Why do I like the ear phones? It will keep the noise from the iPad when the kids are playing their games. It drives my husband crazy when he is watching the news and all he can hear is the sound from the iPad game. Mostly it is our son who turn the volume so loud. This pink ear phone really is helpful. What about you? Do you have an ear phone? What color is it? I am linking this entry to the 25th day of blog photo challenge.